The topic of women and wealth is one that is increasingly gaining global attention among a variety of audiences, and rightly so. Over the past 50 years, the role of women in industry, the economy, and the global wealth landscape has evolved dramatically. And as with other historically underserved—and occasionally misunderstood—market segments, women represent a key growth opportunity for the financial services industry. To be sure, the industry's ability to adapt and evolve to better serve the unique needs of women will likely determine the trajectory of growth. Here, I'll highlight some high-level influences on female clients' decision-making process, the effect of those influences on investing and planning matters, and ways you can use this information in your everyday interactions with your clients. Women today control more than half of U.S. personal wealth and are expected to inherit 70 percent of the $41 trillion in intergenerational wealth transfers over the next 40 years. Women-owned firms have a $3 trillion economic impact annually and account for the creation or maintenance of 23 million jobs (16 percent of all jobs in the U.S.). These firms are growing at twice the national rate of any other group and, if viewed as an individual country, would have the fifth-largest GDP in the world, according to a report by the Center for Women's Business Research. Clearly, women have a growing role in today's financial world. With this in mind, let's take a closer look into the factors that may affect their decision-making process, especially as those factors relate to financial decisions. The decision-making process for any individual—male or female—involves a combination of subconscious influences, including societal and biological considerations (among numerous others). As we explore some of these influences on women, keep in mind that the general observations outlined here, although useful, should serve only as a starting point for better understanding the complexities innate to each client. 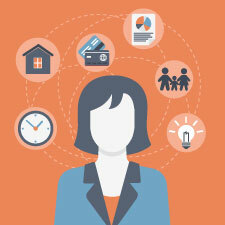 In How to Give Financial Advice to Women, Kathleen Burns Kingsbury defines the female culture as one of "connection, shared emotional experiences, and support," noting that these societal influences, which can shape and mold mind-sets and perspectives, may also reflect generational differences. As Kingsbury points out, women currently in their 60s and 70s were raised in an era in which society expected them to get married and raise children. Women currently in their 20s and 30s, on the other hand, were raised with a very different set of expectations and opportunities. 2) Biological influences. In The Female Brain, Louann Brizendine notes that "our distinct female and male brain operating systems are mostly compatible and adept, but they perform and accomplish the same goals and tasks using different circuits." She further explains that men and women "use different brain areas and circuits to solve problems, process language, experience and store the same strong emotion." Generally, women have a larger limbic system relative to that of men, which may contribute to a propensity to care for others. The area of the brain associated with emotion and memory formation tends to be larger in women, possibly correlating to a heightened ability to account for specific details. Women tend to have more connections between the left- and right-brain hemispheres, a factor often associated with the ability to multitask and effectively communicate verbally. 3) Ingrained money scripts. In the context of investment and financial decision making, money scripts and definitions of wealth and success are influences worth exploring. You may have noticed that your clients tend to follow unique money scripts—thoughts or beliefs about money and its purpose in the world and our lives. The sum of these thoughts and beliefs determines your client's money personality, influencing financial habits over his or her lifetime. These thoughts and beliefs are often established early in life, when children or adolescents observe parents and other important caregivers managing money. According to Kathleen Burns Kingsbury, understanding a client's money scripts can provide insight into personal biases, tendencies, and preferences when it comes to investment and financial decisions. She also describes a woman's definition of financial success as being able to achieve her long-term goals and objectives, not as winning or losing relative to the markets or a stated benchmark. Liz Perle, author of Money, A Memoir: Women, Emotions, and Cash, believes women tend to perceive money as a finite resource, whereas men see it as a renewable resource. Cindy Conway, director of marketing for Wilmington Trust's Wealth Advisory Service, explains in a 2009 InvestmentNews article that "men tend to define wealth in terms of status and power. Women see wealth equaling personal productivity and as a means to independence and empowerment." These observations lend some insight into historical categorizations of women as more risk averse, focused on longer-term horizons, and slower to make financial decisions in certain situations. But just as women define money, wealth, and financial success differently, they may also approach investing and financial planning differently. The above influences—combined with a client's unique set of personal values and life circumstances—help shape the financial goals and objectives on which a long-term investment strategy and financial plan are based. Practice active listening and interviewing techniques. Often cited as the foundation for good communication, active listening encourages female clients to share their stories, validates their feelings, and stimulates a productive conversation. The process of active listening and verbal engagement through interviewing helps many women connect, build relationships, and make decisions. Connect via social media. Based on dialogue, details, and sharing of experiences, "social media speaks to the female brain, culture, and desire for a sense of community," says Kathleen Burns Kingsbury. As an added benefit, social media can also help you engage millennials and other tech-savvy clients. Support learning through group discussions. Many women learn best through discussion and engagement. So, it's no surprise that many women prefer to attend meetings, workshops, or discussion groups among peers. Seek to build trust gradually. Generally, it takes women longer to develop trust in a relationship. Trust is paramount to forming long-term client bonds based on mutual respect, accountability, and reliability. You might assume, based on the information presented here, that women would gravitate more to certain elements of the investing and financial planning process (i.e., charitable giving strategies, education planning, intergenerational wealth transfers, passive investing). That view, however, is likely too narrow. The reality is that as women continue to play an increasing role in industry, the economy, and the global wealth landscape, their needs from an investing and financial planning perspective will continue to expand—creating a significant opportunity for advisors and the financial services industry. Have you found that your male and female clients' decision-making process differs? Do you target your services to a niche group of women? Please share your thoughts below!